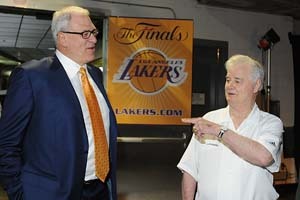 Before Sunday afternoon's loss to Denver at Staples, Phil Jackson spoke at length on the news Tex Winter, pioneer of the triangle offense and longtime assistant coach and mentor, will be enshrined in the Naismith Memorial Basketball Hall of Fame.While Jackson was clearly pleased by the news, there was also a great deal of anger and frustration in the length of time it took for the honor to come. Winter, born in February of 1922, suffered a stroke in 2009 and reports indicate declining health will prevent him from attending his induction ceremony. For Phil Jackson, news Tex Winter will be inducted into the Naismith Basketball Hall of Fame was welcome, but bittersweet. Below is the full exchange between reporters and Jackson. It's an interesting and revealing read, with insight not only to what made Winter such an important figure in the history of the sport, but his role in molding arguably the most successful coach in modern sports. Q: What have you learned from him more than anything else? Jackson: How to develop an offense from skill drills is probably best thing that Tex taught. That basketball starts with being able to learn how to pick up the basketball and pivot. From there, you move into passing, and then the other things that become more complicated. But you have to start from very basic beginning with basketball. Q: You've often described him as a contrarian -- someone who would get in your face and tell you you're wrong. Does anyone else have that relationship with you? Has anyone else told you you're wrong as many times as he has? Q: He's number two, though? Jackson: I'll tell you a story. Red Holzman, when we had a reunion -- I think it was 10 years after the championship [he had as a player with the Knicks in 1973] -- Red brought his wife over and said, "You know, she's the real coach. She tells me how to live my life." That's kind of the way mothers are. They're the ones that tell you what's right and wrong. Q: It seemed like you had written off the possibility of him being voted in. You'd said most of his contemporaries -- the people who would have known his career -- had passed away. Did you have any idea it was going to happen this year? Jackson: For the past 15 years there have been people telling me that Tex is going in the Hall of Fame. When Tex was verbally and cognizantly capable of receiving this award, I would have been much happier. The fact now that he’s had a stroke that’s impaired his capabilities, it kind of irritates me a little bit that this wasn’t done 10 years ago when he was still serving basketball at such a great capacity. Still, in all, I’m happy that it’s been awarded. Q: Has anyone connected to that process ever given you feedback as to why it took so long? What was keeping him out? Jackson: Tex said it right. Most of his contemporaries had passed away. The idea that an assistant coach would be in the Hall of Fame kind of grated at some people. It was made up for head coaches or general managers or people that had played the game itself. But Tex was the winningest basketball coach in college when he went into the pros with the Houston Rockets. He had been a head coach in so many different realms, in so many different arenas. Not only in the Big Ten, but the Big Eight and also out here with Long Beach before he retired as an active college coach, that to be hired on as a coach to the coaches -- which is what Jerry Krause wanted to do for him -- seemed like an unusual position. He was shuttled and shunted around in the Bulls organization a little bit during different realms of coaches, between Stan Albeck and Doug Collins, but we had a relationship that went very deep, Tex and I, simply because I wasn't a very good coach and didn't have a lot of knowledge. He had a lot of knowledge. He and Johnny Bach, his contemporary, who were my co-assistants when I was on that Bulls staff, kind of educated me about the different formats of basketball. Then Tex spent two summers with me, teaching me how to develop all the drills that I've used all these years, skill drills to develop the system that he's taught. In that system, in that aspect, Tex was willing to go anywhere in the world to teach the offense and to teach basketball. His giving to the game itself is something that is a great benefit to a lot of people. I mean people in the Philippines and New Zealand and Iceland and around the world remember his tour and his time spent freely and givingly, without really remuneration, to just promote the game of basketball and in particularly his style of it. Q: Did he sell you on the triangle, or did you come to it another way? Jackson: No, actually the Knicks played a form of the triangle offense. We had a little system, without having a corner fill, we played a system that's very similar to that. As a player, I liked structure. I think it helps players settle into the game. I liked it as a player and believed in it. Before I ran into Tex and was coaching in the CBA (Continental Basketball Association), I ran what was called a flex offense. Which has its limitations, and I recognized them. In the process of coaching the Bulls at that particular time, Doug [Collins] was often befuddled by the fact that we had no real point guard to contest with Isiah Thomas. Not too many people did. Tex kept encouraging him that a system offense would be able to play without having one specific ball carrier, or floor leader on the floor, and tried to convince Doug into running this system. Having inherited that team and knowing we had a guard named John Paxson, who was a really terrific player and a good leader, but not particularly a point guard, it was very easy to adopt that system of offense, and use it in a variety of ways we still continue to do. In which a guy like Derek Fisher shares the point guard responsibilities with so many people. With [Kobe] Bryant, with [Lamar] Odom, and so forth. It's a shared opportunity, which is kind of a lost art in our game. Q: You mentioned he was honest and direct with you. What was the value in Tex having that approach with players, too? Jackson: We used to say there wasn't much of a governor on Tex. He just spoke what his mind impulsively told him to say and it was like the mind of the basketball gods. If you played against the rules of the game, he was going to comment to you or comment to me in hopes that I would comment to the players later on. He got frustrated with players at times -- a Michael Jordan who he said couldn't pass the ball right, or [Shaquille O'Neal] who wouldn't take coaching very easily, or Kobe who over-penetrated or handled the ball too long so the offense didn't run right. So, every star that I ever had on a team, except Scottie Pippen, basically he had trouble with parts of their game. Q: Does [Brian] Shaw sit in the seat that Tex used to sit? I think he sits to your right. Is that where Tex used to sit during your early days? Jackson: No, Tex sat in between myself and the trainer, and Chip Schaefer will tell you that many of his pants were marred by ink stains when Tex would get excited in a game, and he'd start scribbling and it would come off the paper on to his pants.